Welcome to the website for my three books. I write in a conversational style, with the intention of helping everyone, regardless of circumstances, learn to live with compassion, joy, and purpose. To this end, all of my books include easy-to-learn exercises and practices that come alive through the use of personal stories. My heartfelt wish is that you find the peace and well-being we all hope for. Now in a revised and updated edition! 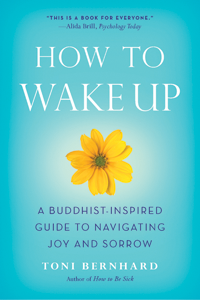 Winner of the Nautilus Gold Medal in Self-Help and named one of the Best Books of the Year by Spirituality and Practice. 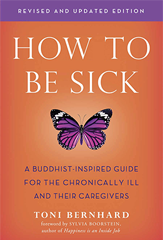 "...Bernhard excels at demonstrating from personal knowledge that the Buddha's promises to ease suffering aren't just empty words." “Toni Bernhard bears the mark of a true teacher: someone who uses simple, heart-penetrating words to say profound things." "Practical and insightful. In this book, you'll find a path to living with greater ease and freedom—awakening to possibilities you may not have known existed before." 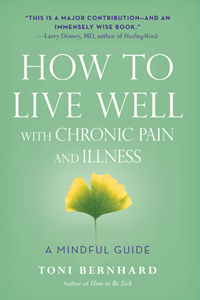 —Elisha Goldstein, Ph.D., co-author, A Mindfulness-Based Stress Reduction Workbook.